If you own a spray paint or auto body shop in the Memphis or surrounding Mid-South area, your work environment is full of highly flammable liquids. In an area constantly exposed to fumes, chemicals, spills, and leaks, fire is always a threat in a commercial spray paint booth or auto body shop. How protected are your employees, customers, and property from the threat of a fire? At State Systems, Inc., we offer fire suppression system installation, inspection, and maintenance services for commercial spray paint booths and auto body shops throughout the Mid-South—including Tennessee, Mississippi, and Arkansas. Call us today or contact us online to request service or schedule an estimate. For spray paint shops and auto body shops, we recommend the MONARCH Pre-Engineered Dry Chemical System—the industrial-strength leader for spray paint booth and auto body applications. Alarm bell – Lets your workers and employees know when to clear the area. Detectors – The system utilizes temperature rated heat detectors in your protected area to sense when there’s a fire. 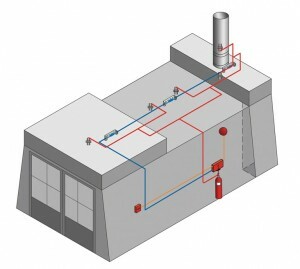 Pull station – In case you need to manually activate your fire protection system. Nozzles and caps – Specially designed to protect your system from paint contamination or blockage. Control heads – Easy to install and activated by your detectors or pull stations. PAC 10 and 200 cylinders –The system allows for the simultaneous actuation of 10 to 20 cylinders for maximum suppression and protection. Time delay – This feature allows your exhaust fan to wind down. Agent tanks – Available in a number of sizes, the experts at State Systems, Inc. can help you decide how much agent you need to protect your auto body shop or spray paint booth. Call us at 866-308-5701 or contact us online to learn more about the MONARCH system or to have one installed in your Mid-South auto body shop or spray paint booth. 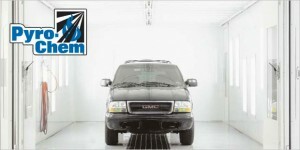 In addition to installation, State Systems, Inc. also offers inspection and maintenance services for your automotive or spray paint shop’s current fire suppression system. Our safety and security departments rely heavily on State Systems’ experience, expertise and knowledge of our facility.